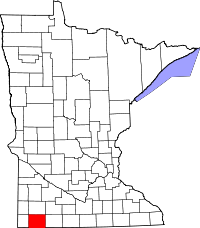 Nobels County, located on the Iowa border in southern Minnesota, has two primary options for researching the vital records of the area. The County Recorder's office is the primary local resource for obtaining physical copies of records, which all are dated from about 1870 to the present, except for military discharge records which were first recorded in 1919. The website lists all relevant forms and provides instructions on how to submit them. Upon being filled out, applications can be submitted by mail, faxed, or in person at the office, which is located at 315 Tenth Street in Worthington, MN. Any inquiries can be emailed to the office directly. In addition to the County Recorder, the Nobles County Genealogy Group has a research area within the Nobles County Library and Information Center that has a computer available to search the indexes of all records the Group has on file.